Nokia has promised to launch so many smartphones of their brand and i am still wondering, are these upcoming smartphones of Nokia all going to be launched in 2017? Seems like Nokia is trying to cover up all those years of their silence over Android smartphones by programming tons of Android devices with the brand name ‘NOKIA’ crested on it and all night be launched in 2017. We all know how long we have missed the specs and features of Nokia company, but so far so good we are going to have more of them this year. Also Read: Nokia 6 Release Date, Images, Specs, Features, And Price. Nokia 8 may not be the first Nokia smartphone you’ve heard about but it’s among the list of them expected to come out in 2017. I just can’t wait to handle any of the smartphones. Well let’s discuss the review, rumored specs, and release date of this upcoming Nokia 8 smartphone. Nokia 8 is expected to come out of box, running on the latest Android 7.0 Nougat OS, holding a Chipset of Qualcomm MSM8998 Snapdragon 835, a CPU of Octa-core 4 × 2.25GHz, as well as an Adreno 540 GPU. Nokia 8 having its screen size to be 5.7 inches with a resolution of 1440 × 2560 pixels has an IPS LCD capacitive touchscreen (with over 16M colours) as its display type. Its screen is protected with a Corning Gorilla Glass 5. Now let’s discuss about its memory. 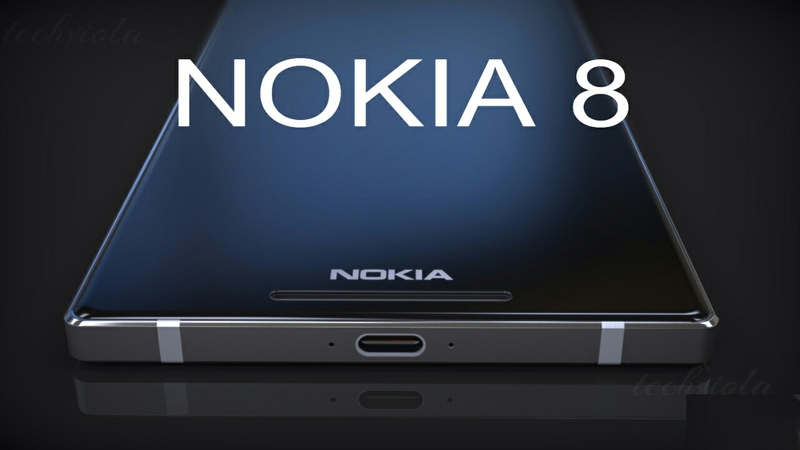 Nokia 8 is expected to come out of box, housing a 64/128GB space as its internal memory, i.e Nokia 8 may be unleashed in two types with both having a difference in their internal storage memory. But both devices are expected to house MicroSD of up to 256GB as both types have card slot. All these storage spaces of Nokia 8 are maintained by a whopping 6GB RAM. One of the most impressive features of Nokia 8 is its camera. Nokia 8 is expected to hold on to a 24MP primary (rear) camera with an autofocus, phase detection and a dual-LED Flash. Of course all these put together with its 24MP should give a clear and real picture. Other features of its primary camera include face detection, Geo-tagging and touch focus. Speaking of the Nokia 8 secondary camera whose capacity is 12MP, this certainly will make the device suitable for selfie lovers and video call makers, of course a device with 12MP will definitely give a clear picture. Nokia massive comeback is no longer a rumor, when the Nokia 6 was first released in China, it’s sells where tremendous. We’ve seen numerous concept images of the potential Nokia smartphones and they’re undoubtedly superb. Most of this (Nokia) android device brings premium specifications and thus they’re slowing and steadily winning the hearts of various consumers. The competitions between the smartphone company’s will be fierce since the father is back. Overall Nokia 8 is a spontaneous device which brings top notch features and it’s worth budgeting for.